Updated Dec. 12th, 2014 – 12:57pm MT – Added new information about VMware vSphere 6 web client. Once the curtains fell on VMworld 2014, VMware administrators began to sort through all of the news, new products, and other information that came out of the event. I’ve already written a bit about EVO: RAIL, the vRealize Suite, and vCloud Air, but there was a lot of other information released that deserves a deeper dive. One product that was mentioned often by VMware executives was the upcoming VMware vSphere 6.0 release, which VMware CEO Pat Gelsinger said was now available in public beta form. Yet while many VMware execs mentioned individual features of vSphere 6.0 in piece-meal fashion, there wasn’t an umbrella announcement for vSphere 6.0, which means that we’re likely to get more official news in the weeks in months to come. That said, there was enough information release during VMworld for us to start assembling a picture of what vSphere 6.0 will have to offer feature-wise, so I’ve cobbled together some of the available information below. Note: Given that VMware vSphere 6.0 is still in beta form, I’d expect the following list of features to be tweaked and revised as the product gets closer to final release. I’ll continue to update this post as new information becomes available, so please bookmark this page for future reference. If you know of a vSphere 6.0 feature that isn’t listed here, please drop me an email and I’ll credit you and add it to the post. So what new features will VMware vSphere 6.0 have to offer? 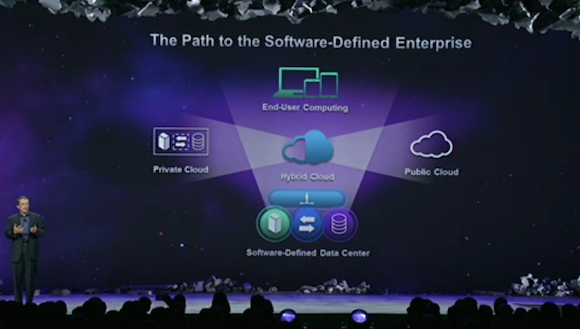 Some information was made public this week at VMworld 2014, and I’ve assembled the following list of new features, largely gleaned from the day one and day two keynotes, as well as some of the sessions and other information released at the show. VVols were previewed years ago at VMworld 2012, and VMware has steadily been working on the technology since then. In the video embedded below (and in a companion VVols blog post) VMware gives a bit more information on what VVols is. VMware vMotion is one of the most popular features vSphere features, and allows running virtual machines to be shifted from one physical server (or several) without any downtime. VMware’s Raghu Raghuram mentioned during the VMworld 2014 Day 2 keynote that they were planning to make several improvements to vMotion in vSphere 6, namely Cross vCenter vMotion and Long Distance vMotion. Cross vCenter vMotion: This feature will allow applications to be migrated from physical racks managed by different instances of VMware vCenter. Prior to vSphere 6, migrating VMs between different instances of VMware vCenter wasn’t possible, so this feature should make the lives of VMware administrators a bit easier. One of the most eagerly-awaited new features for VMware vSphere 6.0 are the improvements being made to the vSphere web client, which many admins rely on to monitor their VMware infrastructures. Petri IT Knowledgebase contributor Trevor Pott has also written an excellent article over at TechTarget entitled ‘What VMware needs to do to convert the vSphere Web Client haters” that outlines some areas of suggested improvement. Let’s hope that VMware follows his advice and implements some of the changes suggested. So are you looking forward to VMware vSphere 6? If so, please drop me an email with what you think of the show, or you can also contact me on Twitter or Google+. You can also catch up on my posts in the Petri IT Knowledgebase forums.